Miami: Future Bike Mecca of the South? Let’s face it. Miami is not the first place that comes to mind as a biker’s paradise. In a state which has some of the highest rates of bicycle and pedestrian crashes and fatalities in the country, Miami is one of the biggest offenders. But all of that is changing. With a magical confluence of bike enthusiasts, policy makers, traffic snarls and the introduction of bike share, Miami is seeing the genesis of comprehensive bicycle infrastructure. Planning geeks know that bike share signals a place’s appetite for biking as an alternative means of transportation. In cities like Denver, Chicago and New York bike sharing programs have yielded a groundswell of support and hard data to justify investment in bicycle infrastructure. In November 2014, Citibike launched their second bike share initiative in Miami to compliment the highly successful bike share in Miami Beach. Forty-four stations in downtown, South Miami and the Upper Eastside neighborhoods are making biking a more viable alternative to driving to compliment the work of Miami’s most vocal biking advocates. 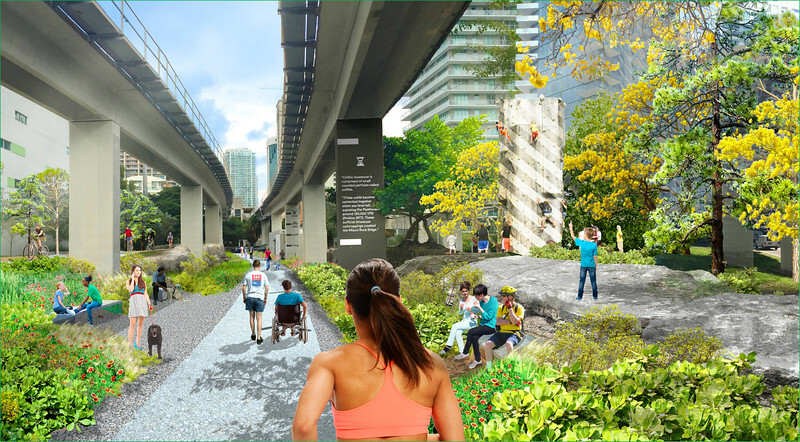 One such advocate, Meg Daly, envisioned redesigning an existing asphalt path beneath Miami’s elevated rail line into a gorgeously landscaped linear park and urban trail–connecting 10-miles along highway US 1 to downtown Miami. Coined as the Underline, the project was first tackled by the University of Miami School of Architecture in a 2014 design studio. Students not only addressed the off-road trail design, but proposed solutions to reduce conflicts with vehicular traffic at roadway crossings. Friends of the Underline partnered with Miami Dade County under the direction of Parks Chief of Planning and Design Maria Nardi, and used the studio’s design renderings to raise funds for the Underline master plan. The plan, which was designed by James Corner Field Operations, provides comprehensive design standards and contemplates 4 distinct segments each with destination parks. The total price tag: $110-$120M. The first phase will transform downtown Miami’s Brickell station into an urban forest with the ability to connect north through downtown and west to the airport with the potential to connect to other dedicated biking facilities like Baywalk and the Miami River Greenway. The Baywalk is Miami’s best kept secret. It is was created by a 1979 City ordinance which required that all developments on the waterfront set back fifty feet for public access. You won’t find Baywalk on any map, it’s not marked by any sign and there are gaps at some bridges and in places which haven’t been redeveloped. A 2012 study by the University of Miami School of Architecture’s Jake Brillhart, with funding by the Miami Dade County Metropolitan Planning Organization, suggests a 15-mile promenade along Biscayne Bay and the Miami River connecting downtown Miami west to the Miami Airport, north to the Design District and south to the Rickenbacker Causeway. In a recent collaboration between the University of Miami School of Architecture and Arquitectonica Geo, under the direction of professor Wyn Bradley, students developed designs for a cohesive linear waterfront park along the northern portion of the Baywalk. Also known as the Biscayne-Line, this waterfront park intersects three bridges which connect between Miami and Miami Beach. In anticipation, several land developers are already putting their money behind this project by constructing pocket parks along the trail. And the Miami Commissioner, Ken Russell, has committed to improving the Baywalk downtown. Already further along, the Miami River Greenway is substantially built thanks to the Miami River Commission—an appointed governing body mandated by the State legislature to protect and enhance the river. The southern terminus of Baywalk connects to Rickenbacker Park, a proposal by Bernard Zyscovich to redesign 3.5 miles of the Rickenbacker Causeway. Cycling on this high speed roadway is dangerous. The plan was created in memory of Aaron Cohen, a young father who was killed by a driver with a suspended license. Plan Z, as the proposal is named, would create a separate facility for cyclists, runners and extreme athletes who are drawn to the causeway for its views of the pristine Biscayne Bay and access to Bill Baggs nature park. A dramatic bicycle bridge entirely separate from the roadway would funnel bicycles and runners safely across the causeway through a new park and a gateway to the Village of Key Biscayne. A fourth off-road bicycle facility is being proposed at the southern terminus of the Underline. The Ludlam Trail is envisioned as a six-mile linear park on a partially abandoned rail corridor, connecting north/south through the center of the county to the airport. It has the potential to reach 34,000 people and connect to two transit stations. 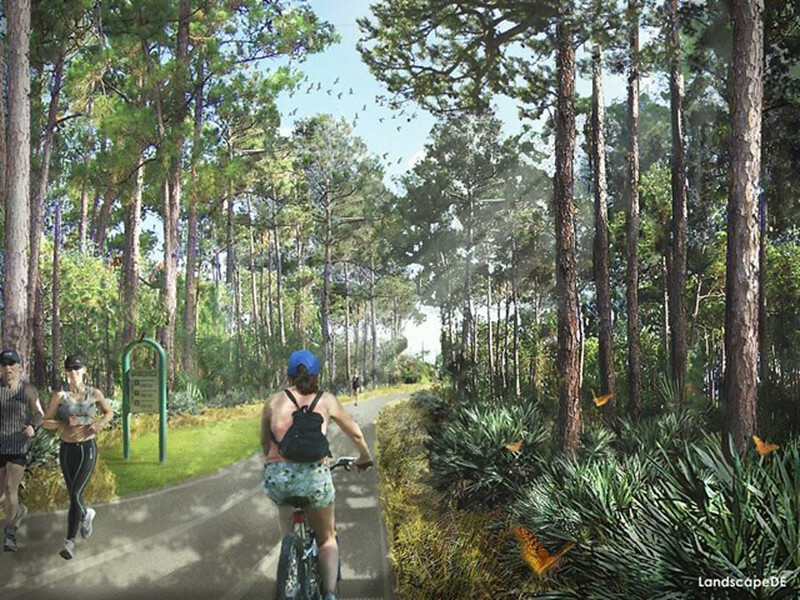 The Ludlam Trail envisions a 100’ wide bike and pedestrian way on land owned by Florida East Coast Industries (FECI). And they’re close to making this a reality. Friends of Ludlam Trail, spearheaded by Tony Garcia and Frankie Ruiz, is working with FECI and Miami Dade County to open the trail to the public in less than a year. In the meantime, Friends of the Ludlam Trail host regular events and bike excursions on the trail in partnership with FECI.